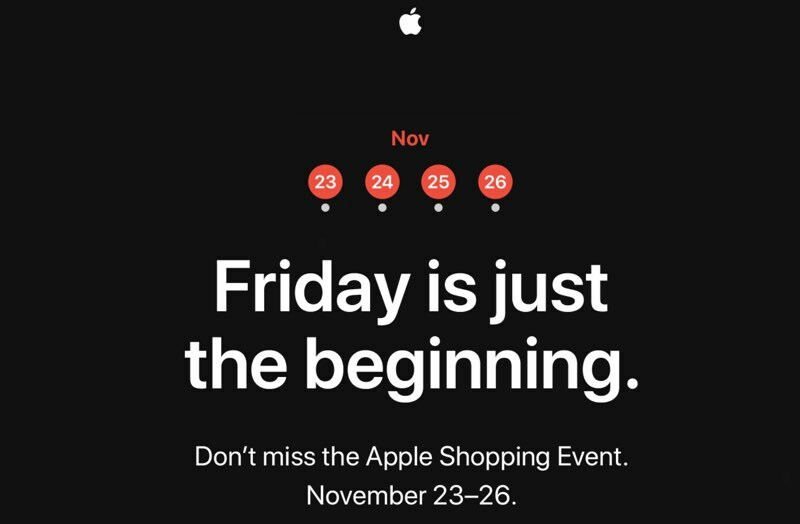 Apple in 2018 is planning to hold a four day "shopping" event that will presumably see Apple products available at a discount or with some kind of gift with purchase. On Apple's website, there is a blank shopping event page that will presumably be populated with deals when Black Friday rolls around, and Apple today sent out teaser emails to customers letting them know about the upcoming sale. Apple's shopping event will kick off on Friday, November 23 and it will last until Monday, November 26, aka Cyber Monday, another popular day for deals. Last year, Apple held a similar shopping event that saw the company offering Apple Store gift cards worth up to $150 with the purchase of select devices including Macs, iPhones, iPads, and Apple Watches. Apple's deals have historically not been quite as good as discounts available from third-party retailers, so if you're shopping for something specific on Black Friday, it's best to take a look at all of the available deals at each retailer before making a decision. We'll have in-depth Black Friday coverage later this week, and to plan ahead, make sure to check out our Black Friday roundup where we're aggregating all of our Black Friday deals. Apple is basically known for NOT giving BF deals. This def indicates that they are struggling. In 2018, the words 'Apple' and 'Discounts' don't really belong in the same sentence. Apple is basically known for NOT giving BF deals. This def indicates that they are struggling. Please spare a few $ for Timmy this Christmas season. Maybe I'll get a lightning headphone adaptor for £8.95 instead of £9. To be honest it's insulting for Apple to hint that they're going to give customers discounts when they've been hiking prices up year after year. It is just a teaser that will disappoint. BF deals will come from retailers other than Apple. 3 stickers instead of 2! I like how they carefully avoid the word “sale” because of regulations.